Click an activity below for more information. 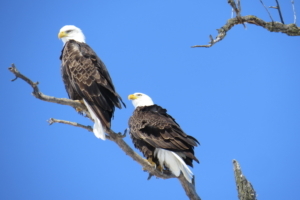 If you are lucky you can catch sight of Bald Eagles nesting throughout Watonwan County. They are easier to spot from late fall to early spring when there are no leaves on the trees. Intersection of 7th Ave S. and 3rd St S.
Take me out to the ball game! 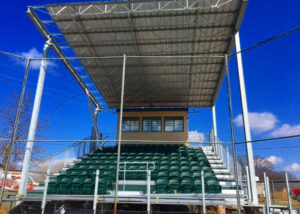 Enjoy watching these teams from the new grandstand at Veteran’s Field- Express Baseball, St. James A’s Amateur Baseball Team, St. James Saints Baseball Team, Legion Post #33, and VFW Post 1912. Take it all in from the first base viewing deck, or from the stadium-style grandstand. Try a pork chop on a stick or a Dairy Queen treat from the concession stand. For a schedule of events visit the website above. Concession Stand- Try a pork chop on a stick or a Dairy Queen treat! Check the website for schedule of games to watch! There are two baseball fields with bleachers and backstop at the High School. The South field is regulation size with no outfield fence. 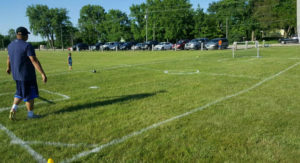 The North field is youth size with no outfield fence. Come shoot some hoops and play a game of basketball with friends at one of our great outdoor basketball court locations. St. James offers four miles of paved trail around beautiful St. James Lake. All season long take in the picturesque views of the lake, and enjoy being surrounded by nature and wildlife. You can use the trail to test your exercise endurance wile enjoying the scenery, and even stop for an extra workout at the exercise station along the way. 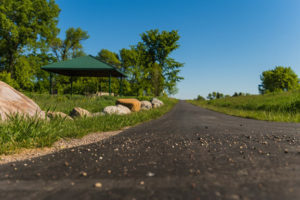 At the connection of St. James Area Bike Trail and the WatLine Trail, there is a gazebo that offers shade, picnic tables, benches, adult monkey bars, and parallel bars. WatLine Trail extends south for five miles along Highway 4, and end at Long Lake Park. The paved trails in St. James are a great activity for all ages, with trail users enjoying the safety and location that they offer. 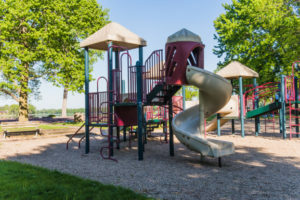 Expert tip: A good starting point for your adventure is at Memorial Park on Levee Boulevard, where there is ample parking, picnic tables, and other outdoor activities. Click here for a recreation map of the trails and Memorial Park. For the biking enthusiast the Hammond Highway offers a great destination ride with scenic views. This wide-shouldered highway extends for 11 miles from St. James to Madelia. 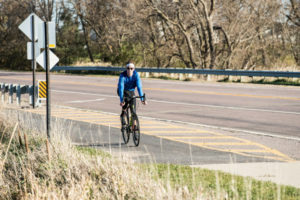 See the Watonwan County Trail System map below for this, and other bike routes in Watonwan County. 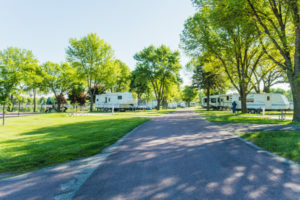 Nestled between St. James Lake and the Outdoor Pool with beautiful surroundings, Tiell Campground is a campers dream. Enjoy the lakeside view from one of the 21 RV camping sites. If you don’t have a camper, no problem! There are two tent sites available for your use. The campground is in walking distance to our historical Railroad themed museums and is located on the paved 4 mile St. James Area Bike Trail. New in 2017! 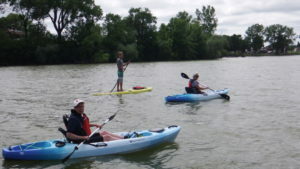 Kayaks and paddle boards for rent! Sands Country Cove Campground is a twelve acre campground located on Kansas Lake. Visit their website for more information. Eagle’s Nest Park is an 80 acre park located approximately 6 miles East of St. James, just North of State Highway 60. 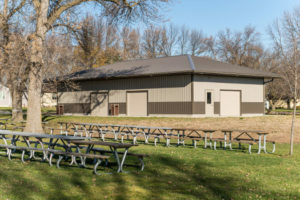 The park lies along the South fork of the Watonwan River, in one of the most wooded and scenic areas within Watonwan County. Adjacent to the park is the 18-hole golf course which is open to the public. 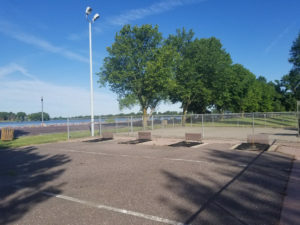 Voss Park is located on a small lake and is conveniently located adjacent to park grounds and all the action at the annual Butterfield Threshing Bee. 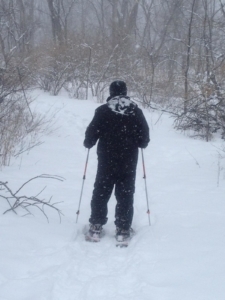 For the cross country skiing enthusiast, the best option is Eagle’s Nest Park with its scenic trails that wind through the forest. Enjoy 5 miles of trails at this 80 acre park just 5 minutes from St. James. 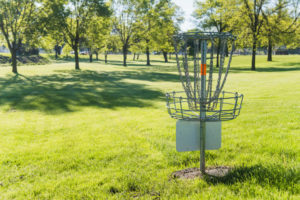 This 9-hole disc golf course starts by the St. James outdoor pool and winds around to Memorial Park, complete with lake views! Every hole is Par 3, which makes it a fun course for all ages. Disc golf is also a great winter activity, and can be played year-round. Pick up your score cards near the entrance to the pool. 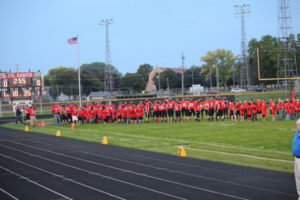 High School Track surrounds the field, which is open to the public if not in use by the school. South Fork Golf Club is an 18-hole tournament golf course located just off of Highway 60, east of St. James. This beautiful, newly designed course is set amidst wooded hills and a winding creek. This course is both challenging and fun for all ages. 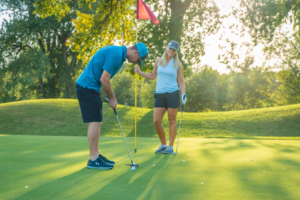 After a round of golf, take in the view while enjoying a drink and a bite to eat on the outdoor patio. If it’s fresh air and exploring you seek, head just east of St. James for some hiking or trail riding. Eagle’s Nest Park is 80 acres, with multi-use trails that wind through the most beautiful, deep-forested area within Watonwan County. The park lies along the south fork of the Watonwan River. Play a fun game of horseshoes at any of the four lit horseshoe courts. 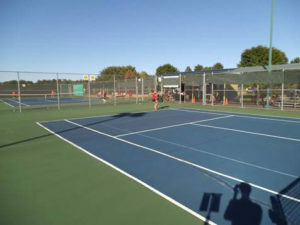 These courts are open to the public and are located in Memorial Park between the north shelter and the skate park. 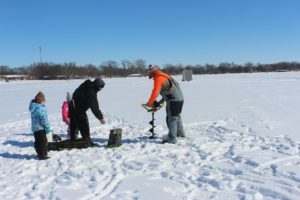 Ice fishing is a great way to enjoy the outdoors in the winter season, and there are plenty of options around St. James. Cut a hole and drop a line at any of the following lakes in the St. James area: St. James Lake, Long Lake, Lake Hanska, Wood Lake, or Kansas Lake. 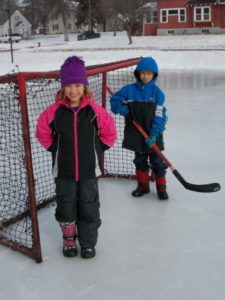 Skate for fun or compete in a friendly game of hockey at our outdoor ice rink at Southside Complex. If you get cold, head in to the cozy warming house which is conveniently located right on site. 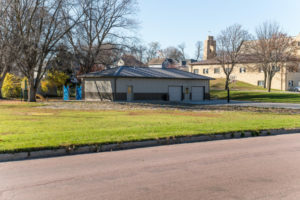 Memorial Park features a large green space with a playground at the North end (Miracle Playground) and a playground at the South end (Sertoma Playground). This park includes ice skating for the winter with a warming house and public restrooms attached. Enjoy outdoor basketball courts year-round at this park. The City of St. James has multiple shelters for rent. Visit their website or call City Hall for more information. For other event space options, click here. Test your skating skills at the outdoor skate park located in Memorial Park. This park is equipped with 1/2 pipe, 1/4 pipe, and a grind rail. If horsepower is more your style, check out the 217 miles of groomed snowmobile trails in Watonwan County. Safe play-zone for children with sand boxes, etc. There is a full softball-size field with backstop and bleachers at the St. James High School. 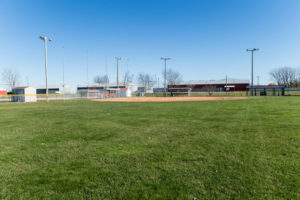 There is one youth softball field at Northside Elementary School. If you and your family like to swim then St. James is the place to be. Pick from any of these great swimming locations. 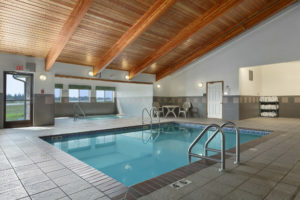 The Super 8 located on Heckman Court features a heated indoor pool and spa open daily. The City of St. James outdoor pool is located on Tiell Drive featuring a large pool, diving board, 150 ft water slide, and toddler splash pool. St. James High School’s large pool is a great place to swim laps or participate in organized aerobic exercise. There are two public beaches just a short drive from St. James, where you, your friends, and your family can get your toes in the sand and soak up the sun. Just South of St. James is Long Lake Wayside Park, with an easy-to-access beach on a pristine lake. North of St. James is a hidden gem. Cottonwood Trees frame the paved walking path that leads you down to Hanska Lake beach, providing a secluded retreat. This seasonal outdoor pool is opens in June and closes end of August. Check the City’s website for current rates and hours of operation. This facility is equipped with a waterslide, diving boards, and a splash pool. The pool can be reserved for parties as well. Lifeguard on duty. This heated indoor pool and spa facility is open 7:00am to 10:00pm daily. If you are not a guest of the Super 8, you may purchase a punch card for $35.00 that includes 10 punches. Individual pass cost is $5 per person. This large heated indoor pool is open to the public for lap swimming and water aerobics through Community Education. Call the Community Ed office with questions: 507-375-4517. Lap Swimming costs $20 for a 20 punch card. Available Wed/Fri 6:30-7:30am and Monday from 6:15-6:45pm. Pay at the door. Water Aerobics class is $40 for a 20 punch card. Available Mon/Wed/Fri 7:00-8:00am and Mon/Wed 5:15-6:15pm. Pay at the door. Long Lake is located 5 miles south of St. James on Highway 4 on the East side of the road. The entrance to the park is located just off County Road 11 about 1/2 mile North of County Road 6. Bump, set, spike! Play some volleyball in St. James. 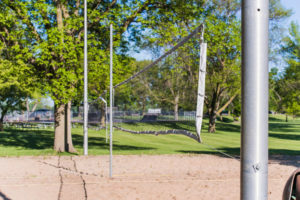 You can play sand volleyball at either Memorial Park or South Fork Golf Club. Kayaks and paddle boards are available to rent at the Outdoor City Pool during pool hours.